Though consumption and retail sales have made significant headway toward recovery this year, the 6.3 percent decline in consumer credit since July 2008 will remain a drag on economic growth and job creation through the rest of 2010. Top-tier borrowers retain access to credit, but these lower-risk consumers continue to impose austerity measures as they de-leverage in the wake of the recession. At the same time, less creditworthy borrowers have been substantially cut off from credit due to high levels of lender risk aversion. 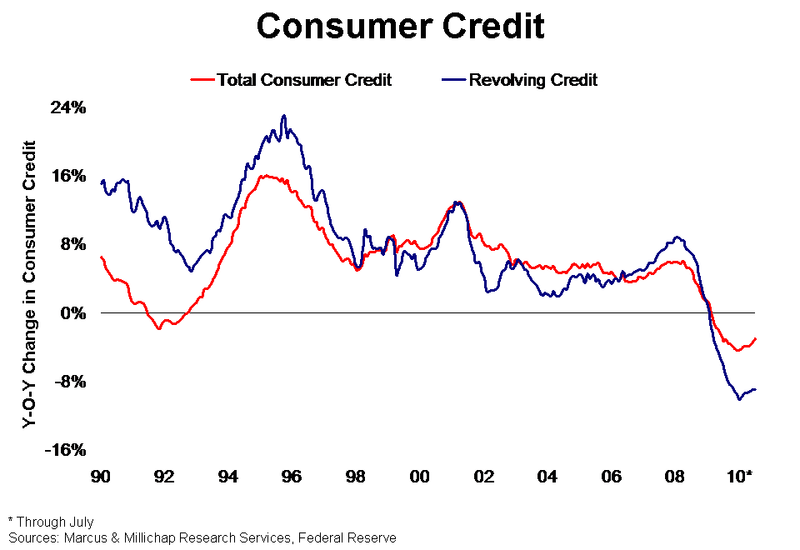 As a result, tightened consumer credit will remain a headwind to the recovery as it drags on consumption. Even after credit becomes more readily available, consumption will likely continue to lag until employment and income growth improve sharply, an event not likely to occur until mid-2011. Total consumer credit outstanding fell 0.1 percent in July, marking the 20th monthly decline in the past 22 months. Further, a 0.5 percent drop in revolving credit, which consists almost entirely of credit card debt, fueled the overall decrease in balances outstanding. With July’s decline, revolving credit has fallen for an unprecedented 22 consecutive months, slipping by 15 percent, or $145.6 billion. Several factors have contributed to the decline in consumer credit. Creditworthy borrowers continue to de-leverage by paring debt and purchasing fewer goods and services on credit. Even the addition of 723,000 private-sector jobs year to date through July failed to stimulate borrowing, with revolving credit declining 4.4 percent during this period. Less qualified borrowers, including many who remain unemployed or under-employed, have been denied credit, further curtailing consumption. Compounding the issue, lenders continue to write off uncollectible balances, increasing the amount of credit card debt charged off by banks by more than 200 percent over the last two years. In the near term, only reinvigorated job growth will encourage a resurgence of lending and borrowing, but substantive hiring remains elusive. The decline in consumer credit has joined job losses, overdevelopment and worse-than-usual store closures to pressure retail properties. During the 22 months of declining revolving credit, an additional 205 million square feet of vacant space accumulated. The vacancy rate rose 200 basis points since late 2008 to 10 percent in the second quarter of 2010 and will climb another 40 basis points this year to 10.4 percent as retailers continue to adapt to the weakened retail environment. Tightened retailer inventories in the face of reduced consumption have impacted warehouse and distribution properties that store and transport consumer goods. Since revolving credit started to decrease in October 2008, the national industrial property vacancy rate rose 270 basis points to 12.7 percent in the second quarter of this year. Negative net absorption during that time totaled more than 166 million square feet. In 2010, declining space demand will increase vacancy 40 basis points to 13 percent on a 19.2 million square foot drop in occupied space. This entry was written by marcusmillichap, posted on September 14, 2010 at 11:36 pm, filed under Research and tagged Consumer Credit. Bookmark the permalink. Follow any comments here with the RSS feed for this post. Trackbacks are closed, but you can post a comment. As a commercial real estate finance professional for 25 years, I can say interest rates are the lowest they have been in my entire career, yet only the best projects can be refinanced today. B- and C quality projects are nearly impossible to refinance, and borrower scrutiny is the toughest I have ever witnessed. Banks are figuratively kicking these lower quality assets and/or borrowers out of the building leaving them few options but to sell, significantly pay down the loans, or be foreclosed. No relief is in sight for the small investor, yet larger and well capitalized borrowers are winning big. Neither political party is addressing the liquidity crunch for smaller CRE investors, and in fact the banking regulators have forced many banks into the position of chasing these customers away. Solution: lower capital requirements for local and regional banks, less “big bank” monopolization and bail-outs. We need MORE lenders, not less. We need standard underwriting guidelines of 1.25 minimum DSCR, and 75% max LTV re-written into these smaller bank lending guidelines. Most small banks are much too conservative given the current “regulation cram-down” on capital requirements. Also Banks cannot make money unless they lend money to collect both fees and interest rates over their cost of capital. The Federal Govt should be lending at ZERO percent to small banks so that they can lend money at 5% to 6% to these small CRE investors, and make very reasonable profit margins. Bottom line: more lending for smaller investors is critical…the big guys already have all the tools to be profitable. Lenders are austere because a large fraction of their CRE portfolios are already underwater and remain a ticking time bomb. No one knows where or when lies the bottom in residential RE and until that’s resolved a real recovery, including CRE will also be a guess. The lenders are keeping their powder dry for more write downs. Lowering capital standards is a prescription for more bank failures!